The Hoba meteorite is arguably the most famous meteorite in the world. It fell in Namibia some time within the past 80,000 years, and, thanks to its massive weight, it hasn't moved since then. 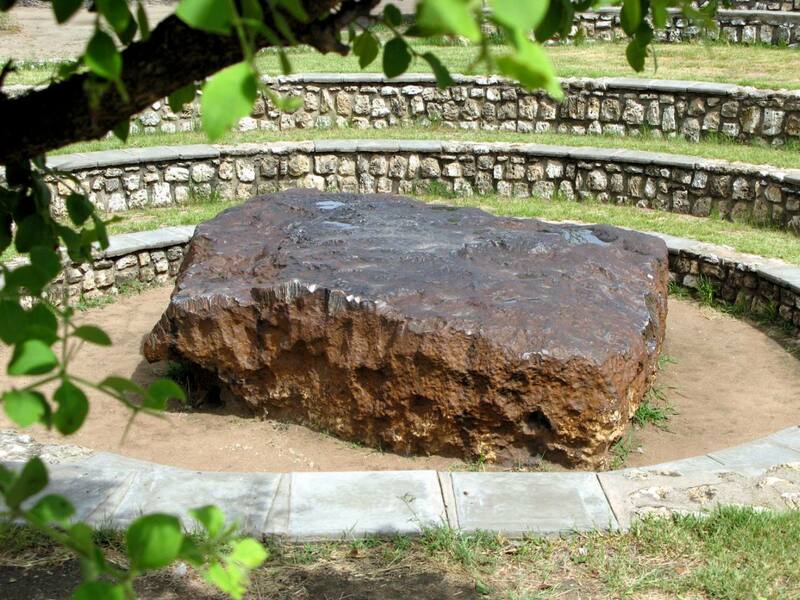 It is estimated to weigh approximately 60 tons, and is the largest known individual meteorite in the world. Modeling suggests that it pushes the boundary of the maximum possible size of a meteorite that can reach the earth's surface in one piece. It is a IVB ataxite, and is surprisingly uncommon. While the weight of the meteorite sitting in Namibia may be 60 tons, very little material has been removed and/or released from institutions, and the mass is now protected as a national treasure. The most recent sale of any Hoba-related material that I have seen was an 8 gram piece of shale that sold for just over $700 on ebay. Shale. Not even true meteoric material. Another seller (3/16/2011) had a 3.61 gram piece of metallic Hoba on ebay -- for $4,900. That's nearly $1,360/g. I'm asking $400/g - less than 1/3 his price, and his is the only other piece of metallic Hoba I know of that has been available recently. *As of 6/2012, that piece has sold, so...at least these pieces are still availble if you're looking for some Hoba. All of these specimens come from an IMCA member and I have taken pains to verify that they are authentic. They originated from NEMS, and, prior to Russ, they came from an older institutional collection, the identity of which he wished to remain confidential. They have been deeply etched, but Russ assurred me that they appeared to be cut from a piece that he had sold and that the pattern was characteristic of deeply-etched Hoba. His reputation is sterling. 4.016 gram thick partslice - make an offer! A nice partslice that displays the same pattern as the others - but it's thicker and has a little more heft. It's not quite 60-tonnes, but it's as close as I've got. 4.016 grams - make an offer!